I have been told by many teachers and writers more experienced than I, that one of the best ways to create good writing is to read good writing. This is a lesson I find easy to embrace considering I love to read. One of the first classes I took at UW-Madison was Deborah Blum's literary nonfiction course, in which I spent the semester enveloped in the work of some great narrative nonfiction writers. One of those writers was Sebastian Junger, whose 2010 book War I've written about previously and recommend. When I discover a writer that I enjoy I try to go back and read their other work. I've done this with Dave Eggers reading Zeitoun, What Is The What, and A Heartbreaking Work of Staggering Genius. I decided to give another of Junger's pieces a shot and added The Perfect Storm to my Summer reading list. 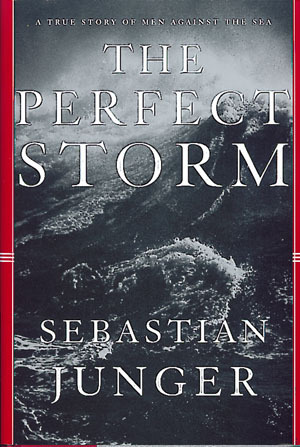 The Perfect Storm was published in 1997, and is the book that made Junger famous. It pieces together the last days of the swordfishing boat the Andrea Gail, which disappeared during a 1991 storm off the coast of Nova Scotia with all six crew members on board. I don't believe in spoilers more than two decades after a story breaks, so I'll go ahead and tell you that apart from some fuel tanks and some debris the boat has never been found, and its crew drowned. 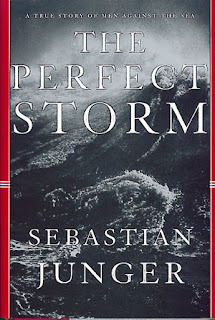 When The Perfect Storm was released Junger was called the next Hemingway. I certainly am not enough of an authority on Hemingway to weigh in about whether that is an apt comparison but I can say that Junger is masterful in the way he tells the story of the Andrea Gail. Communications on the boat were suspended in its final hours, so there is no definitive record of what happened. The last communication from the boat was on the evening of October 28, 1991. After that, what happened to the boat and her crew is open to interpretation. But interpret, Junger does. Based on research on the storm and weather patterns, about the Andrea Gail and how she was built, about swordfishing and what an experienced Captain like the Andrea Gail's Billy Tyne would do when faced with the weather conditions Junger pieces together a likely scenario for what the Andrea Gail and her crew went through in that storm. As a work of nonfiction that tells a story where no one knows for sure what happened, I think The Perfect Storm really works. Junger is honest with the readers that the only way to try to understand what happened to the ship is to understand everything else about the circumstances surrounding her disappearance. He achieves this with an amount of elegance and grace that does justice to the tragedy that unfolded while still presenting hard facts along with probable outcomes as evidence. I found the recreation of what it is like to be on a sinking ship, knowing you are going to drown to be particularly poignant. "They're in absolute darkness, under a landslide of tools and gear, the water rising up the companionway and the roar of the waves probably very muted through the hull. If the water takes long enough, they might attempt to escape on a lungful of air- down the companionway, along the hall, through the aft door and out from under the boat - but they don't make it. It's too far, they die trying. Or the water comes up so hard and fast that they can't even think. They're up to their waists and then their chests and then their chins and then there's no air at all. Just what's in their lungs, a minute's worth or so." I think that what makes Junger's recreation so plausible and acceptable is that he presents options, while still writing with definitive language. I think the book is honest, and raw and that is what makes it work. You can also tell that Junger really did his homework and talked to so many people and read so much about what it is like to be on a boat that he is able to explain the different scenarios. The fact that the scenarios all end up with the same outcome also adds an element of strength to Junger's recreations. He states it so plainly that it gave me chills, "Tyne, Pierre, Sullivan, Moran, Murphy, and Shatford are dead." I recommend The Perfect Storm to anyone. The technical aspects of boat design and mechanics coupled with weather patterns and the physics of how together they affect a boat at sea are so well interspersed with narrative that the story holds your attention the entire way through. I thought the book was easy to get into and handle, while still being able to draw you back over and over if you need to put it down or are reading while traveling. I felt like I learned the basics about fishing, boats, weather, rescue protocol, the physics of the ocean, and the social side of fishing life. There is so much information it opens up a different world for readers, which I think makes it really worth your time. It is also worth noting that The Perfect Storm was made into a film in 2000 starring George Clooney as Billy Tyne and Mark Wahlburg as Bobby Shatford. I haven't seen it, and thus have no recommendation to give but from the trailer it looks like some cinematic liberties were taken with the story while still making an interesting film. I'll be putting it on my ever-growing list of things to see when I have more time. Heya i am for the first time here. I came across this board and I find It really useful & it helped me out a lot. I hope to give something back and help others like you helped me. Find out more pre filled party bags for best Bags. Find the review on this book at essay editing service free - edit-ing.services, and you will be surprised by our brilliant work. You are a great article author, by the way! Thank you! How Endangered Is Endangered Enough?